At Rs 26,960.80 crore, Tata Motors reported the biggest ever quarterly loss for an Indian company. The total income for the third quarter ended December 2018 (Q3FY19) came in at Rs 77,582.71 crore. Tata Motors said it took one-time exceptional non-cash charge for asset impairment of 3.1 billion pounds and the overall performance was dented on account of JLR. The results were announced post market hours on Thursday. The results stumped the Street that expected JLR’s performance in the recently concluded quarter to aid the overall results. “Tata Motors' standalone is poised for around 7 per cent revenue growth. We expect consolidated EBITDA margin to drop by 83 basis points (bps) year-on-year, but there will be a sequential gain of 132 bps y-o-y to 10.7 per cent. The company is expected to be a positive surprise with a 39% YoY PAT growth, led by JLR returning to the profitable zone,” analysts at Antique Stock Broking had said in a results preview note. 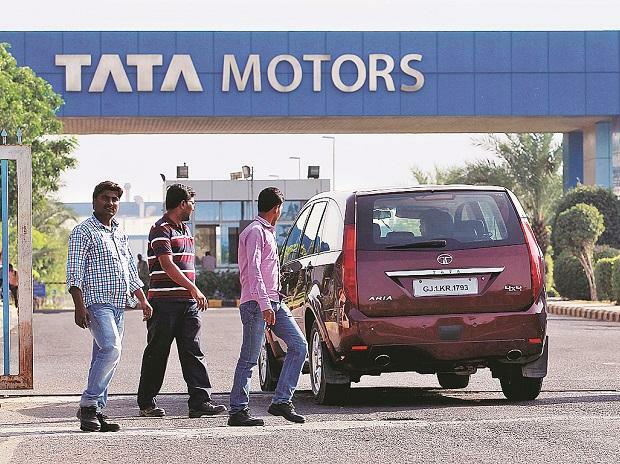 On Friday, Tata Motors and Tata Motors DVR tanked over 20 per cent each and hit a low of Rs 129 levels and Rs 71, respectively on the National Stock Exchange (NSE). However, both recovered partially as trade progressed. While Tata Motors ended the day at Rs 150 levels, down nearly 18 per cent on the NSE, Tata Motors DVR settled around 15 per cent lower at around Rs 81. In comparison, the Nifty 50 closed 1.2 per cent lower at 10,944 and the Nifty Auto index slipped 3.6 per cent. Here’s how brokerages have interpreted the results and their advice to investors. Tata Motors' challenges with JLR continued in 3Q as it took a 3.1 billion pound non-cash impairment and even adjusted for this, performance was below expectations. Resolution of China dealership issues is still ongoing and resulting volume reset could continue over next few months; Brexit is another overhang with no clarity yet. Standalone performance surprised positively though as PV profitability continued to improve and CV margin was stable despite weak volume. We cut our consolidated earnings estimates over FY19-21E to reflect the large impairment charge in FY19E and lower volume in both JLR and standalone business. Our price target reduces to Rs250 (previous Rs300) as we also factor in the impact of roll forward. We maintain Buy as inexpensive valuation and high cyclicality in earnings keeps risk-reward favourable despite near-term uncertainty and headwinds. Retain Sell with a target price of Rs 150. JLR’s margin declined quarter-on-quarter (QoQ) despite higher volume. Big asset impairment dragged Tata Motors into consolidate loss. The demand outlook has worsened in China and India. Cut FY19-21 EPS Estimate by 2-66 per cent. The stock will remain weak given insufficient near-term triggers. We cut our FY20/21 consolidated EPS estimate by 21%/13%. Consequently, our net debt estimate is almost doubling, dragging down the equity value. Hence, we downgrade our rating to Neutral with a target price of Rs 166 (Mar’21E SOTP). We await the nature of assets impaired to ascertain the probability of a similar action ahead given huge capex program (GBP 12 billion over three years). China has gone from bad to worse. That said, management is trying hard to revive the brand by focusing on sustainable profitability for the company and dealers. On balance, given a weak demand outlook, we are cutting FY20E consolidated EBIDTA by 8 per cent and EPS by 26 per cent. Maintain ‘HOLD/SP’ with an SoTP-based target price of Rs 179 (down from Rs 201). We reduce our FY19/20/21E EPS (earnings per share) by 46%/19%/19% to Rs6.2/Rs22.8/Rs24.7, mainly due to lower volume/margin assumptions in JLR’s China operations. In the event of a no-deal Brexit, there can be further cuts on volume and margin estimates. We downgrade our rating to Hold from Buy, with a revised target price of Rs 192 (Rs 256 earlier), based on 1.5x EV/EBITDA for JLR and 8x EV/EBITDA for standalone operations. Despite the cost-reduction efforts, free cash flows are expected to remain negative over FY19-21, due to the large capex requirements of JLR.